The Hausschwein from the Parents Collection designed in collaboration with Cybex by Marcel Wanders is a hollow storage unit made in the shape of a pig. The winner of the 2016 Reddot Award, this fun accessory has a removable nose which enables toys, books or other ephemera to be stored in its belly. With an elegantly quilted pattern on its rump, the Hausschwein is a must-have for parents with an uncompromising passion for interior design and furniture. 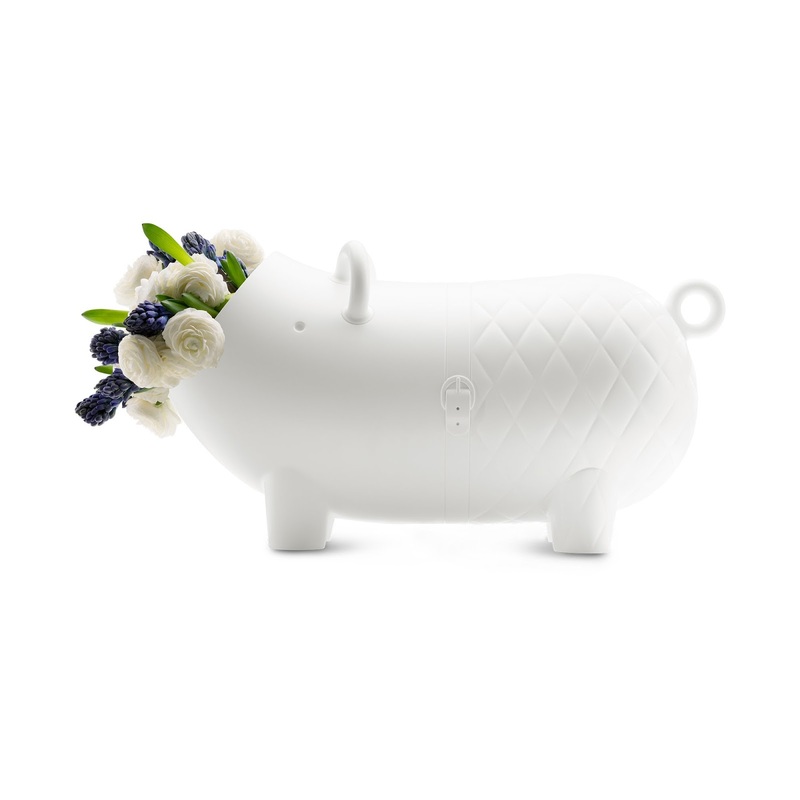 A stylish and convenient addition to any household, the pig is available in white or a sleek matte black finish. 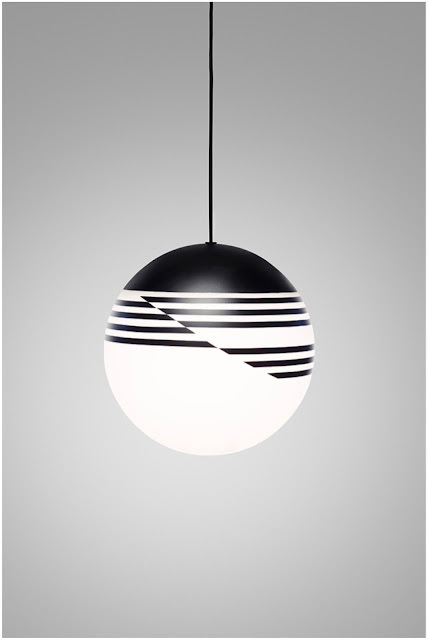 Op Art graphic patterns are the inspiration for this modern pendant light by Lee Broom. Called the Optical Light, it is made from powder-coated spun steel with an opaque glass shade. The asymmetry of the black stripes are in contrast to the classic spherical shape of the globe shade and, when viewed from different angles, the linear pattern changes adding interest to the piece. The Optical Light is also available as a table and a floor lamp. 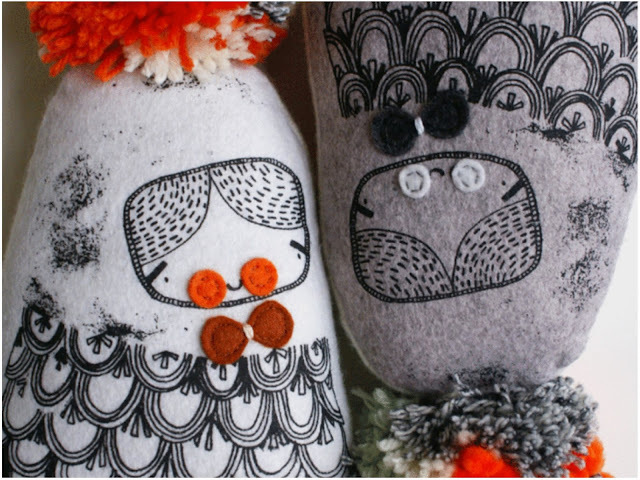 These sweet toys are from Corby Tindersticks, an illustration-led brand that aims to create fun designs and illustrations for children and adults alike. The dolls are lovingly designed and made in Birmingham, England with a machine-washable marl jersey body. The quirky characters include Chloe the Soft Robot Toy, Wilby, Ralph Raddish and Barry Bags. The design of the Spruce table from O'Hara Studio has been borrowed from nature. 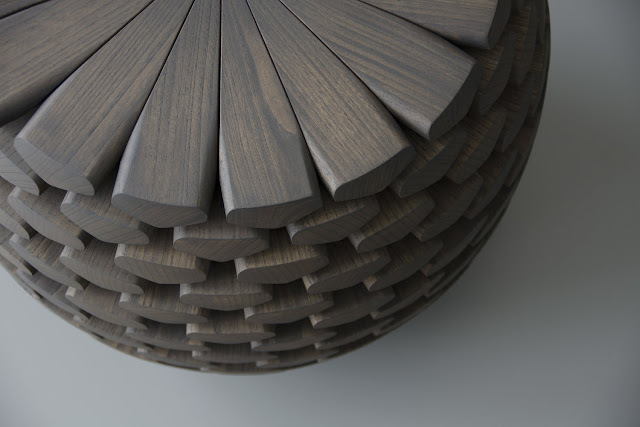 Part of a series, the table draws inspiration from conifer cones of the Alpine forest. The table is assembled from imbricate plates, with scales arranged in over-lapping layers then sculpted and finished by hand. 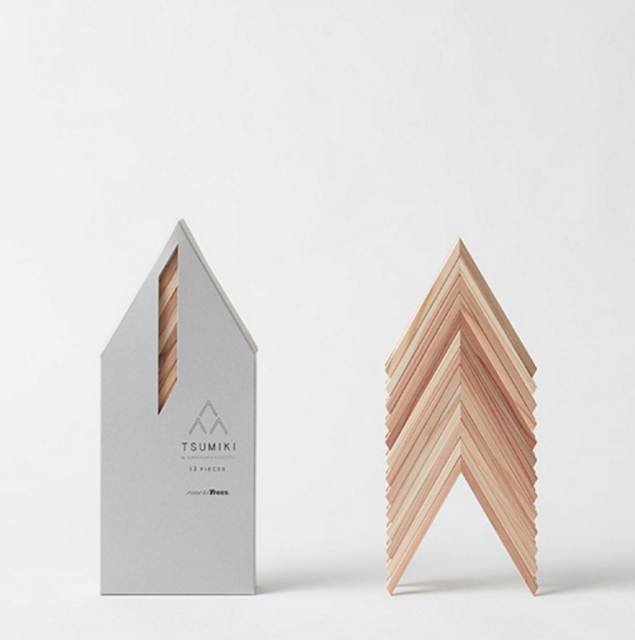 O'Hara Studio offers three designs in the series in a variety of heights. Trinidadian fashion designer Shari Cumberbatch recently launched a capsule collection for her line SHOPSHARI called CANVAS. While SHOPSHARI is more commonly known for its prints, the pieces in the capsule collection consist of plain, but still brightly coloured, Neoprene tops, dresses and bodysuits in neon colours. 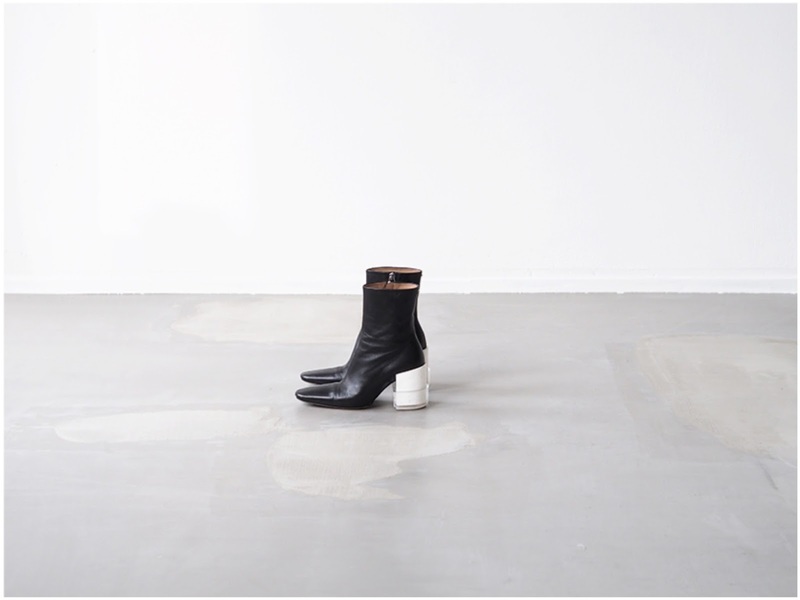 We're in love with these gorgeous, thick-heeled boots from John Galliano for Maison Martin Margiela. With a single white stitch across the front and a white heel encased in protective plastic (it is Margiela after all) they are practical with just the right amount of an edge to make them interesting. The Goed Photostand by Mooi is a simple and clever design. 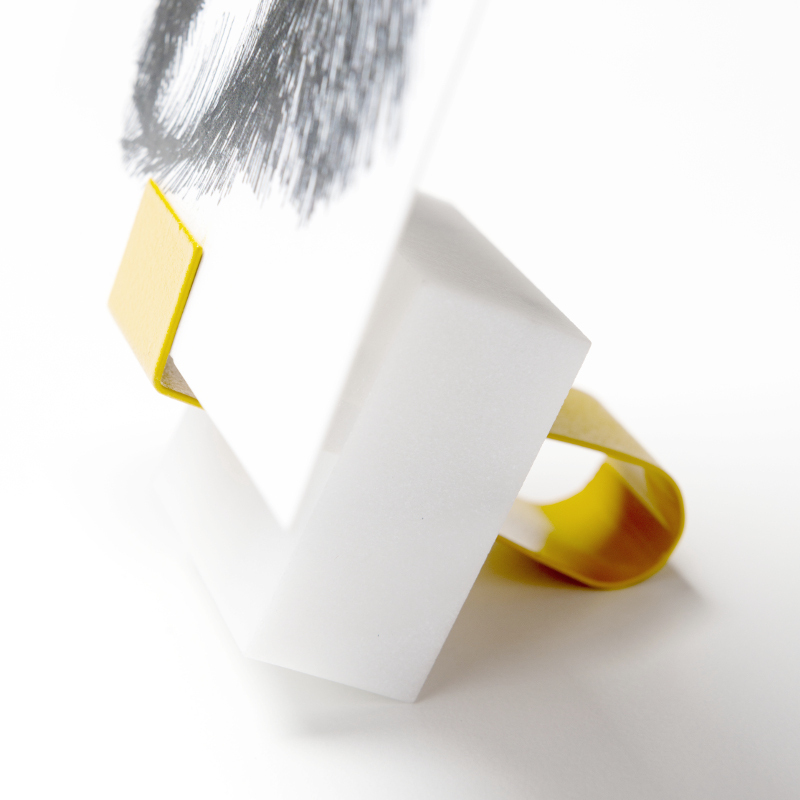 It consists of two parts - a metal clip and a Carrara marble support - which, when combined by sliding the clip into the marble, creates a chic way to display your favourite photos, cards or mini artworks. 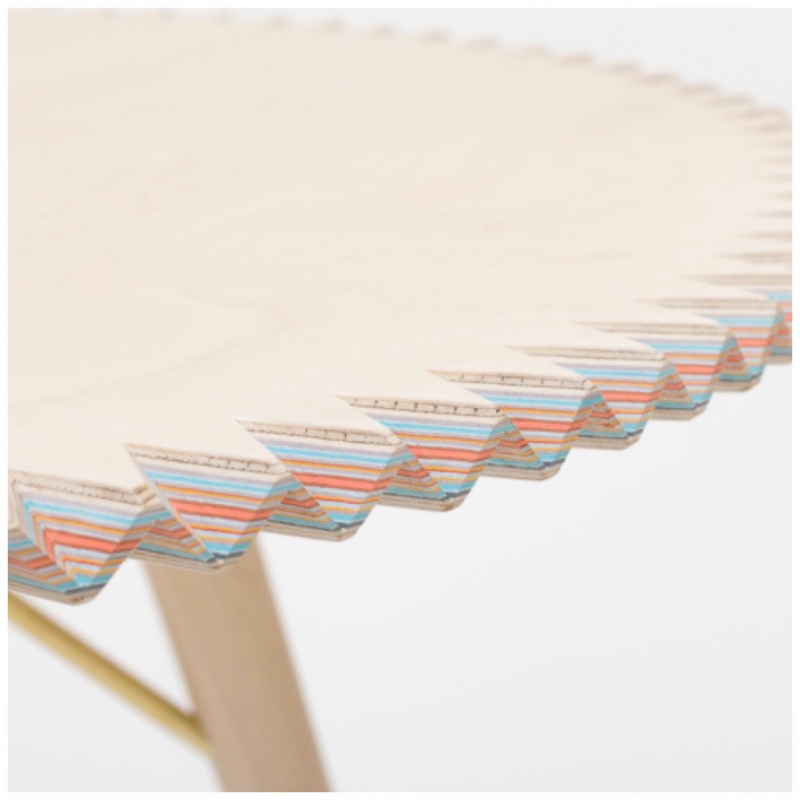 Part of the 'Stories by the Water' project, Breaking Surface by designer Sophie Hardy is a table the top of which is made of layers of multicoloured coloured sheets of paper sandwiched between plywood. The edge of the table has a serrated edge that has been cut to expose the layers. The table was inspired by the small Swedish village of Dals Långed where the economy is based on the paper industry and is a statement on the integration of disparate societies. The village is now home to large international and multicultural communities and for Hardy, the layers of paper represent hidden potential and concealed beauty that she believes exists in these societies. The top core and surface of the table are made of birch veneer and its legs are of solid birch with brass pipe support rails. 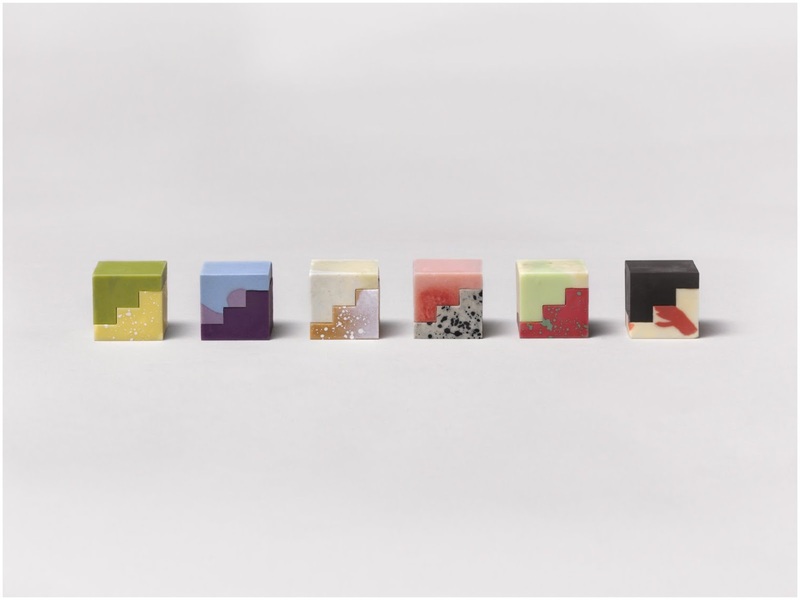 A feast for the eyes as well as the tongue, these modular chocolates are the result of a collaboration between Universal Favourite, an Australian design agency, and Bakedown Cakery. The pair wished to create flavours that could be paired in many different combinations to create a new experience. They designed an original modular shape that was 3D printed into positives and then turned into chocolate moulds. These create edible blocks that can be stacked in a variety of combinations such as dark chocolate and strawberry, pistachio and matcha. Other flavours available include shortbread, blackcurrant, cookies and cream, fairy floss, cherry, watermelon, vanilla, and lemon. 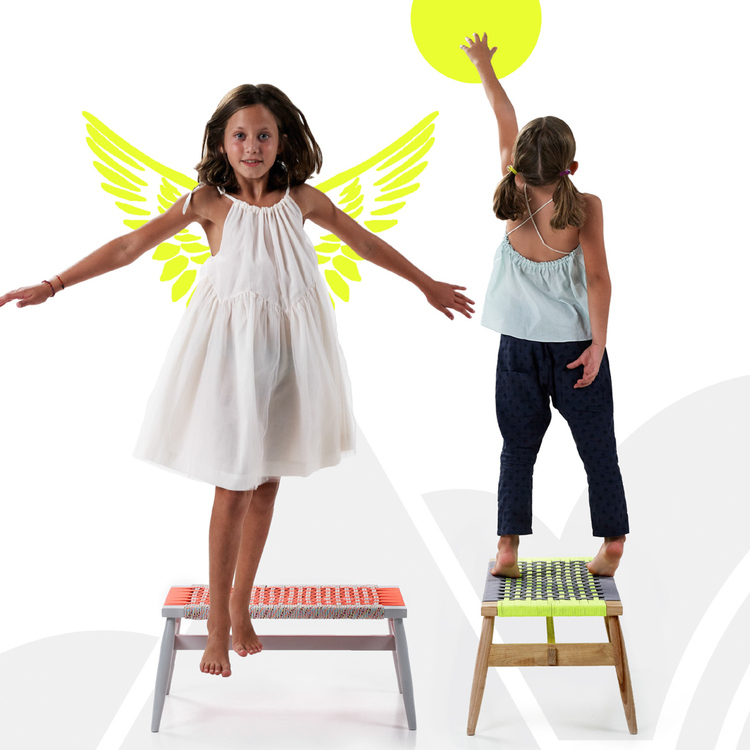 Tired of children's furniture that just looks like a miniature version of your own? Then have a look at this collection of handmade furniture with Greek and African influences by Fudje. Fudje is a design-led brand created as a collaboration by the partners of Edje Architects who, having lived in both Greece and South Africa, took their inspiration for their designs from both of these countries. 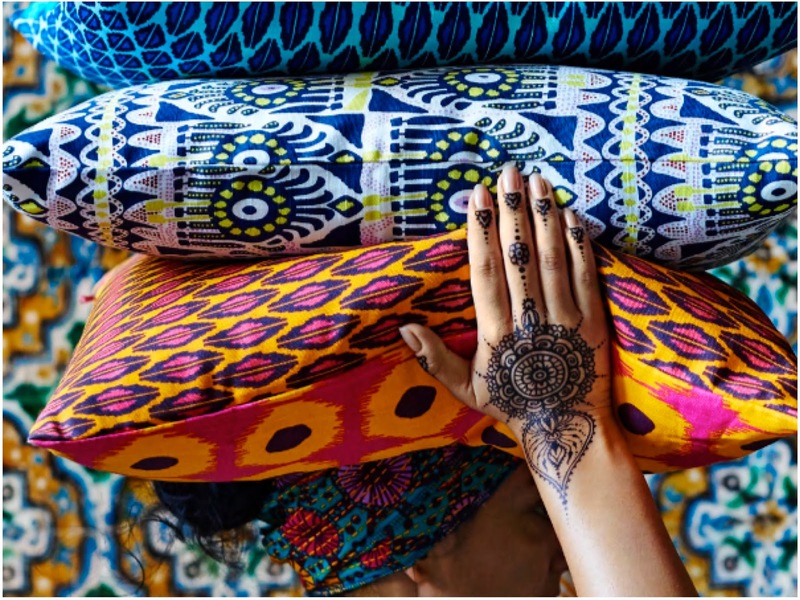 The designers are keen to ensure that their goods are sourced and produced ethically and focus on using local craftsmanship and traditional techniques in the creation of their contemporary aesthetic. Forget about the Superstar, it's all about the Bermuda for 2017. 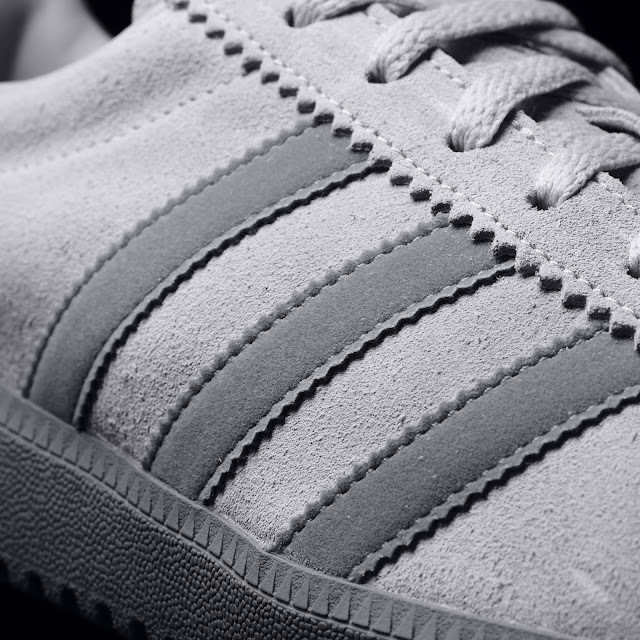 Adidas have reissued this classic sneaker with its football-inspired look in a suede texture. The leather-constructed upper features serrated 3-stripes in a contrasting colour tone. The Bermuda sneaker is available in grey and blue. 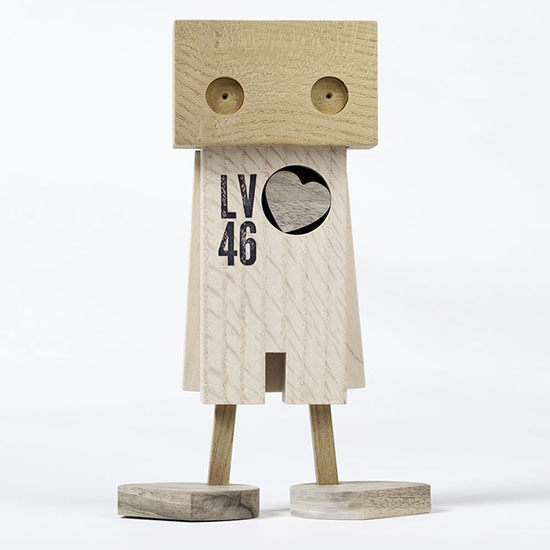 These rustic wooden toys are from Daniel Moyer, a furniture designer who uses offcuts and up-cycled pieces of wood from his studio to make these 9" tall Superhero and Sidekick figures as part of Fdup.Toys. Each character is numbered and the Superhero comes with a removable heart. The pieces are designed and made in Brooklyn, NY. The Lukis Chair by Studio Hiji for Cappellini Collection is a rattan and wood seat made in Indonesia as part of the 'Dignifying Indonesian Rattan' product launch that was held in November 2016. The aim of the show was to elevate the traditionally humble material and use it in different ways to great effect. 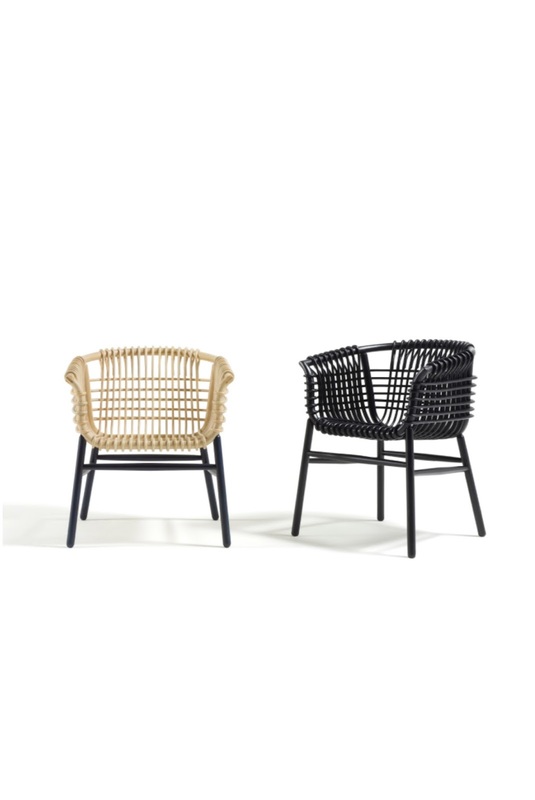 The Lukis armchair is an experiment using small rattan cores for structures that are bent through the main frame and then stacked on top of each other resulting in very rigid construction. The chair also displays the unique character of the wood with detailing at the joints using lathe techniques. Its spare lines are made possible because the wood base, unlike rattan, needs less material for structural support. 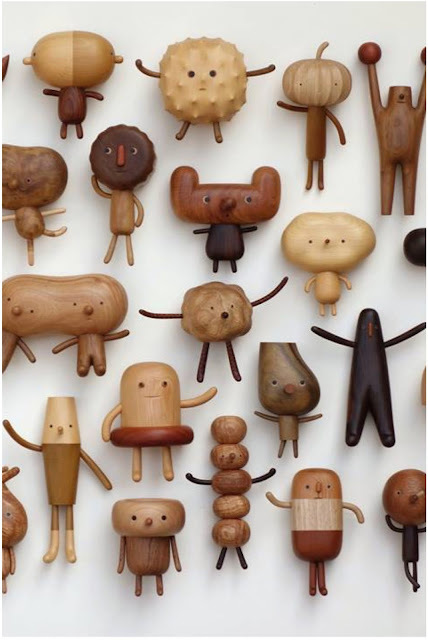 These wood beings by Taiwanese designer Yan Ruilin have so much character and charm. 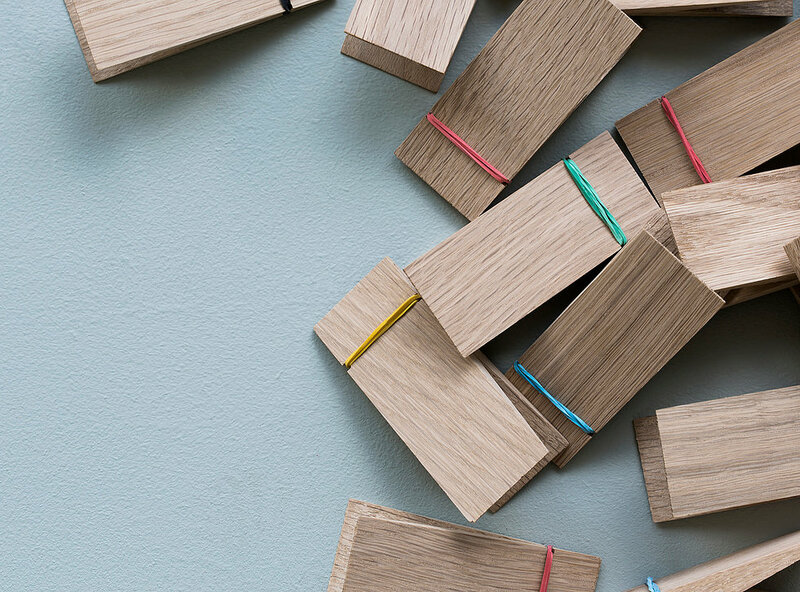 The PINCH clip by MOEBE, a Scandinavian design brand based in Copenhagen, is made of two pieces of solid oak held together by a single rubber band which can simply be swapped out when necessary. One of the wooden pieces has a hole and this allows the PINCH to be hung or mounted on the wall. It's no secret that we have a soft spot for anything mid-century, so we love these wooden city sets from McKean Studio that are based on neighbourhoods in Palm Springs, that mid-century heaven in the Californian desert. 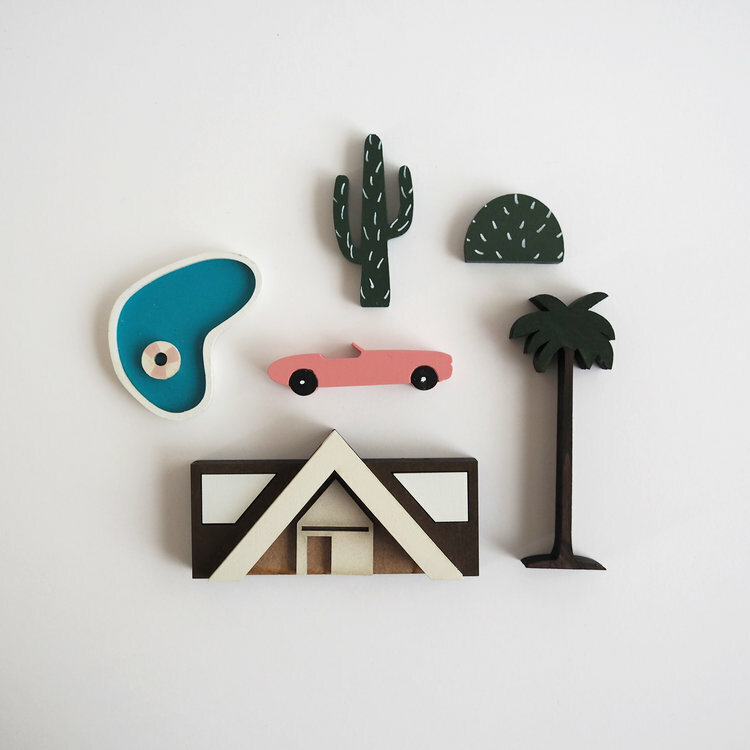 Called the Mini City, the models feature tiny cacti, swimming pools, palm trees and cars and of course iconic architecture found in the area. Each set is comprised of six pieces that are handmade and hand-painted by Joshua and Megan at McKean Studio. Architect Kengo Kuma - one of the most significant figures in contemporary Japanese architecture and who is responsible for creating the Tokyo National Stadium, the main venue for the 2020 Olympics - has created a playful and interactive building set that takes advantage of the structural strength of the triangle. Each piece is crafted from Japanese cedar and has notches cut into the tip which allows them to be stacked in various ways. The set is intended to inspire children to be architects although they look like they'd be fun to play with at any age. A riot of colour and texture, the new, limited edition collection from IKEA which launched last week on March 1 is inspired by Indonesian and South East Asian design traditions. The Jassa collection features an eclectic mix of furniture, textiles and accessories and is about taking familiar things like hand-woven natural fibre objects and batik textiles and transforming them into something new and exciting. It is the creation of Dutch designer Piet Hein Eek and IKEA in-house designers Nike Karlsson, Iina Vuorivirta and Paulin Machado who worked under the guidance of Karin Gustavsson. While each designer was tasked to put his or her own stamp on the collection, the sum of its parts come together to create a cohesive sense of free-spirited fun. The collection includes colourfully patterned cushions, hand-painted plates, a rattan lounger, sofa, armchair, easy chair, pendant lampshades, a room divider, and even a wind chime, and will only be available while stocks last. 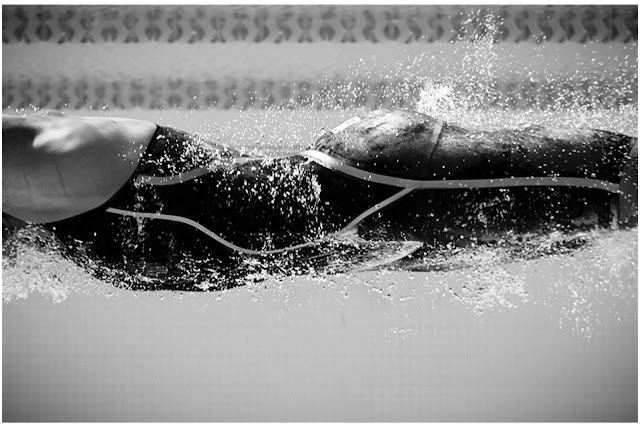 These stunning images of Bermudian Olympic swimmer Rebecca Heyliger taken during a training session at the island's National Stadium won second place for photographer Karen Yeomans in the Editorial: Sports (Professional) category of the International Photographer of the Year Awards. Have a look at some of the other winners here. Let's close our coverage of fashion month with one last look back at London and a collection of covetable, contemporary pieces that made up the sophomore collection of husband and wife duo Longshaw Ward. The pair, who met in the design studio of Alberta Ferretti, used shiny, reflective fabrics including silver foiled leather and sequin-covered net to create a 1980s sci-fi movie feel. The clothes were covered in fluorescent spacecraft and leaf-covered stars both of which informed the colour palette. The denim asymmetrical skirts and cropped, wide-legged trousers were bordered with more of the print and topstitched in gold thread to evoke the traditional finish found on jeans. There were several jersey pieces including t-shirts, sweatshirts and hoodies which were printed with individual drawings and embellished with beading and embroidery. Just as important as the clothes was the jewellery which was handcrafted in their London studio. Brightly coloured glass beads, star and leaf shapes with Swarovski crystals were juxtaposed with hand-worked aluminium wire for a more industrial feel. All the antipodean designers seem to be showing in Paris this season. Here New Zealander Maggie Marilyn artfully mixes athletic elements with ruffled, statement sleeves and flared trousers. Like Maria Grazia Chiuri at Christian Dior where the overarching theme based on a quote by the house's founder was a meditation on the colour blue, post-Riccardo Tisci the in-house studio team at Givenchy also focused on a single colour for their presentation which was a twenty-seven look retrospective of Tisci’s time with the house. 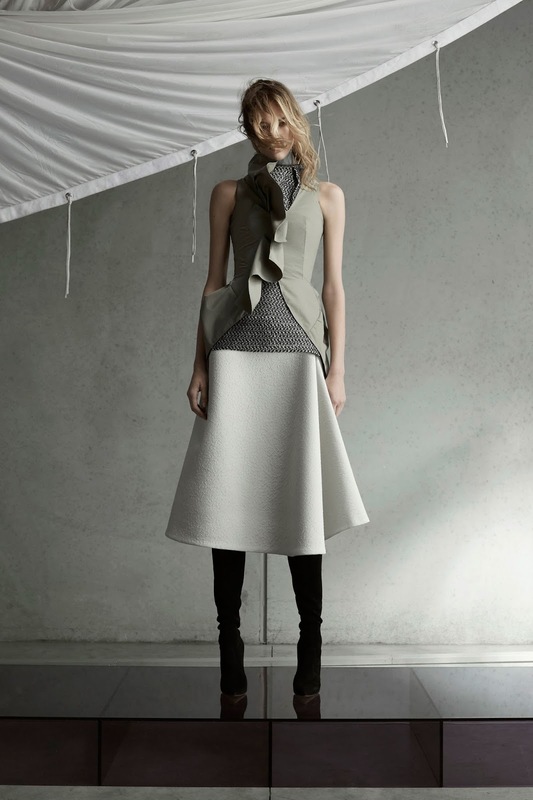 Toni Maticevski, the Australian designer we featured here, is back with another standout collection for autumn. The largely monochromatic presentation (with one pale blue confection thrown in for good measure) included delicate spiderweb embroidery, deconstructed and recycled denim that turned up as patch pockets or sleeveless tops, asymmetrical knits and yards of tulle and organza. Another milestone anniversary for a design house, this time the 20th for Reem Acra. 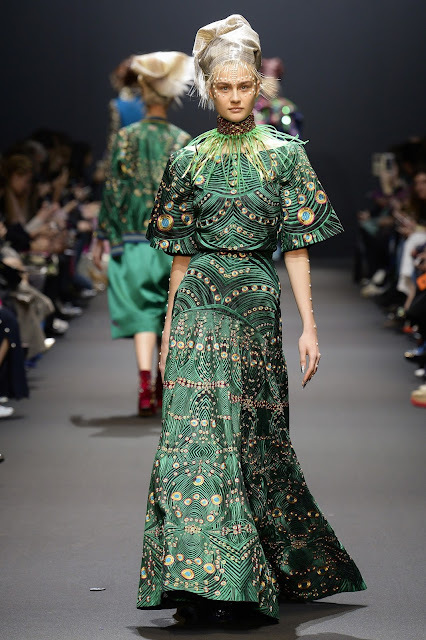 Here she showed structured, elegant shapes in rich, tapestry-like fabrics that were covered in embroidery. The resulting maximalist mix of textiles and textures was pretty striking. Icons featured heavily including a heart shape that was affixed prominently to the chest and, at one point, was literally dripping with jewels, and the all-seeing eye of the hamsa. Dice Kayek showed sleek, well-tailored pieces that had a celebratory feel. Fitting perhaps, as this collection marked the 25th year anniversary of the line. Designer Ece Ege welcomed us to the party with gilded touches and prints that were reminiscent of fireworks. There was much volume on sleeves, coats, blouses and skirts, all of which were precisely tailored. Ege included a range of looks: a Prince of Wales check employed as a trouser suit, separates in green wool and distinctive black or navy cocktail outfits designed to ensure that the party will carry on well into the evening. A very masculine, largely black collection from Haider Ackermann that focused on texture in the form of Mongolian lamb skirts and culottes rather than colour and pattern. The silhouette was structured, long and clean while shoulders were bold. Gold strands - one of the few decorative elements - acted as the unifying theme and reminded us of kintsugi, the Japanese art of repairing items with gold or other precious metals. 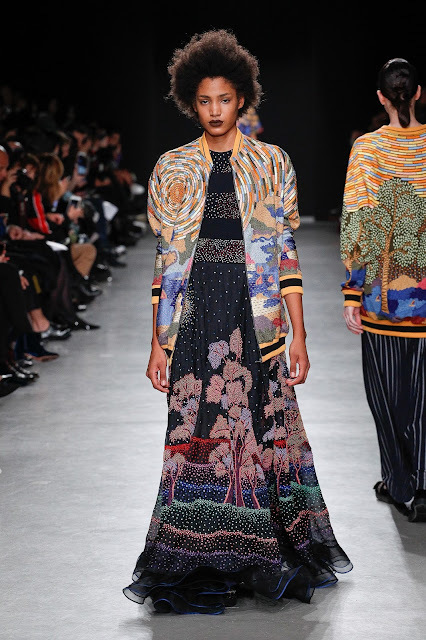 We love the play of texture and print found in Rahul Mishra's collection where stripes were combined with windowpane check and of sunflower and fruit embroideries added detail. Traditionally masculine fabrics were feminised by the use of ruffles and layers. Mishra employed Indian artisans who created handwoven textiles and covered his designs in beautiful embroidered scenes including images of the night sky in slow motion and Paul Signa's "The Pine Tree at St Tropez". 1980s power dressing was reinvented for a new era by David Koma at Mugler. This came in the form of suits and separates, often with hugely exaggerated shoulders, which gave the models a top-heavy appearance. The star motif from the house's best-selling 'Angel' scent was a recurring theme and we liked it best when this was used in abstracted form on mini skirts and dresses. The star motif also showed up on buttons, studs and shoes and was translated into the pointed shoulders, angular lapels and the pleating found on skirts. The final effect was strangely rather futuristic. 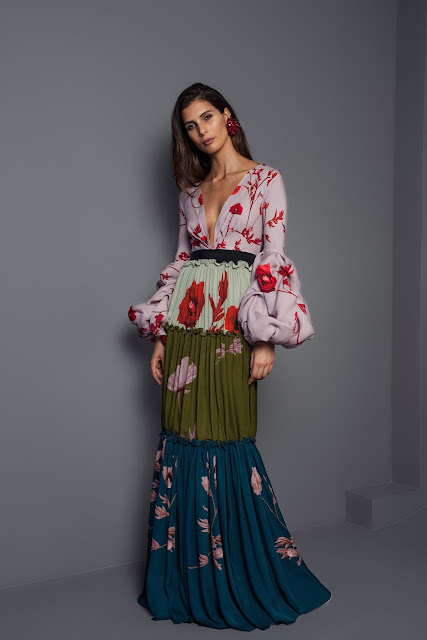 There was a very real world mix of masculine and feminine with Johanna Ortiz's collection which we would wager is how many women who don't have the opportunity (or desire) to wear a gown on a daily basis prefer to dress in real life. The pairing of a higher-end statement piece which, in this case, meant Ortiz's pretty shirting and striped blouses with statement sleeves which were often attached to a bodysuit, combined with something as dressed down as denim worked really well. We liked the floral prints and the palette, the Colombian designer's signature ruffles and bows and the cut of the menswear-style trousers. There was some pyjama dressing which we haven't seen much of this season, and another item which has turned up a lot less frequently on runways than we had initially anticipated made an appearance: several political statement t-shirts were thrown in for good measure. A touch of mysticism from Manish Arora whose clothes were a cacophony of colour and constellations. 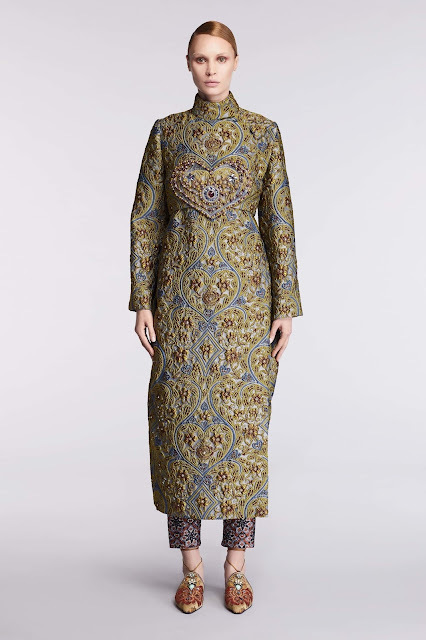 Arora showed very few trousers and most skirts were midi length or longer. They featured kaleidoscopic embroideries, Swarovski crystal embellishments, psychedelic digital prints, hand-cut velvet and boiled wool patchwork. Although the collection was called 'Cosmic Love', the heavenward gaze had a distinctly tribal feel - the clothes were accessorised with modified turbans and spiked collars - which brought it back to earth. Simple but well-cut clothes with a 1940s feel from Alessandro Dell’Acqua at Rochas. The spare silhouette, often featuring an empire waist, was adorned with multiple bows, lace inserts, high-necked frilled collars and basket-woven leather skirts and coats. There were also some heavier coats and dresses in a floral print on a dark background and long, body-conscious dresses with a leaf print. Dell’Acqua featured the initial 'R' on everything: it turned up in crystal on pointy-toed pumps, belts, brooches and bags and was embroidered on sweaters and cashmere knits often as a mirror image. Shoes were worn with knee-high, sheer stockings. There was little drama overall, but the show closed with a high shine, gold fringed look. Let's hop over to Paris for the last week of shows this season and start with this collection from Vera Wang who, like Roberto Cavalli's team, showed clothes that should be classed more as demi-couture. Wang's collection comprised a balletic black, white and gold swan theme and was presented as a film. It featured structured capes, peplums and lampshade dresses paired with long floaty gowns, and high-impact gold feathered breastplates. 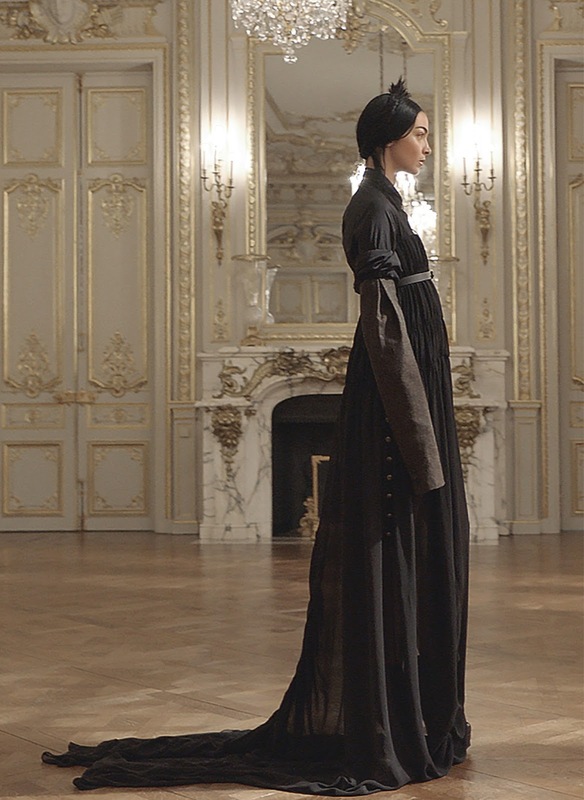 Set in a grand Parisian salon, it harkened back to the designer's past as a young dancer. This is the first time Wang has shown in Paris and comes just as she is due to receive the rank of Chevalier in the Ordre National de la Légion d’Honneur, an award that was established by Napoleon Bonaparte in 1802. Wang took inspiration from the Musée de la Légion d’Honneur and included Napoleonic pieces in the form of military jackets, embroidered patches in bronze and silver featuring the fleur-de-lis, bees and eagles.